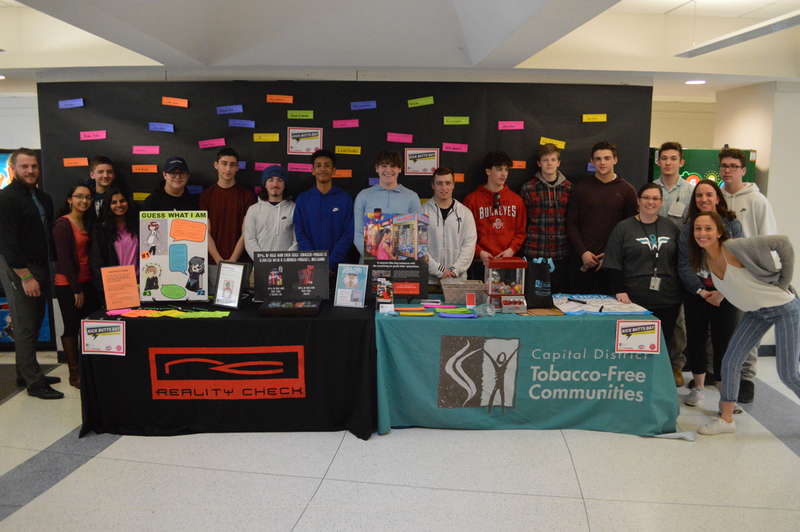 Students and advisors from SADD club participating in Kick Butts Day, a nationwide advocacy day meant to bring awareness to the dangers of tobacco and nicotine use. Columbia High School students participated in Kick Butts Day on Wednesday, a nationwide advocacy day meant to bring awareness to the dangers of tobacco and nicotine use. The event was led by students in SADD club, who distributed information to classmates at tables outside the cafeteria. Students also took pledges to not use tobacco products by signing their names on a wall display. Part of the focus with Kick Butts Day is to inform teenagers about how they are targeted in tobacco advertising. “I think it’s good, and I think it brings awareness to something that people don’t always think about,” said Columbia student Leah Tubbs ’19.